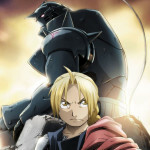 Fullmetal Alchemist Brotherhood is one of those series that almost needs no introduction. Both the manga by Hiromu Arakawa and the two anime adaptations by Studio Bones are extremely well known and loved, each achieving critical acclaim for fantastic character narratives, exploration of themes of war, life, death, progress and suffering, and the philosophical questions these themes raise. It kind of begs the question as to what more there is to say about a series that had its first anime adaptation end almost 15 years ago, and whose manga and second anime adaptation finished up in 2010. Surprisingly (or perhaps not so surprisingly for fans of the series), a lot. 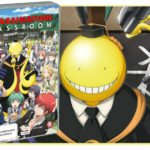 This is a review of part one of the series in a recent re-release by Madman that has divided the 64-episode series into two Blu-Ray/DVD releases. Christmas truly has come early. 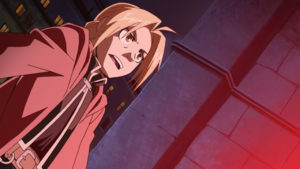 In an attempt to bring their mother back from the dead, Edward and Alphonse Elric violate one of alchemy’s fundamental laws. 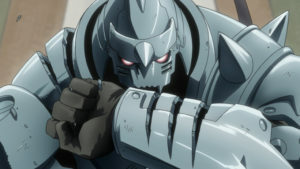 Their attempt to resurrect another human results in Edward losing two of his limbs, and leaves Alphonse’s soul bonded to a suit of armour, unable to eat, sleep or feel the sensations of the world around him. To restore their bodies, the Elric brothers search for the fabled Philosopher’s Stone, which could grant them the ability to surpass the laws of Alchemy and return what they have lost. 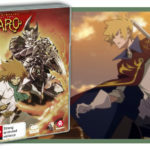 With Edward working as a state alchemist to access resources to hunt down the Stone, the two brothers come across all manner of peoples and creatures in the pursuit of their goal, many sharing the desire to find the fabled gem. Unfortunately, their goals aren’t as innocuous as the brothers’, and as the Elrics learn, the stone and its imitators inspire corruption and leave tragedy in their wake. With all seriousness, I consider Fullmetal Alchemist Brotherhood and the manga it is based on to be immensely powerful and meaningful texts. If I was given the task of writing a list comprising of the canonical texts of anime based on influence and significance, Fullmetal Alchemist Brotherhood would be one of the first shows I would include, and the manga would make my separate list of canonical manga texts in a heartbeat. To me, this series is like a modern-day epic; an elevated narrative telling a story that spans across time and location, asking questions about progress, corruption, morality, war and human suffering, with a dash of fantasy mixed with science-fiction that feels completely organic in the world that Hiromu Arakawa first created in her manga. 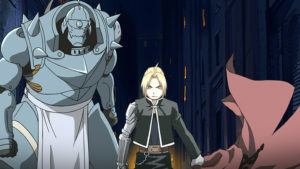 Perhaps the reason Fullmetal Alchemist Brotherhood resonates as much now as it did during its run and initial anime release in 2003 is the relevance of the themes. The treatment of the Ishvalans by the state military and the corruption of the state are intense topics on par with and often directly connecting to or straight up paralleling the laws of nature and the lengths humans are willing to go to achieve their ambitions and desires that are present throughout the series. War and ambition are especially pervasive, with the casual presence of automail limbs for war veterans, depictions of PTSD and the portrayal of the horrifying lengths some characters will go to reach their goals at the expense of innocents. It’s powerful stuff. I will admit that Fullmetal Alchemist Brotherhood has some pacing issues and general growing pains, especially in the beginning when the series is re-telling episodes that have previously been adapted in the 2003 version. 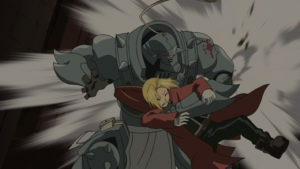 One thing that the 2003 anime has that Fullmetal Alchemist Brotherhood lacks is that its predecessor was able to create extra content (I hesitate to use the word ‘filler’ given its generally negative context) that was good at extending the narratives of characters and using those additions to cause extra drama. The lack of this extra content in Brotherhood results in the disappointing demise of several characters who you can’t help but feel you knew a lot better and a lot longer from the 2003 version of the series. This is an unfortunate product of having two versions of the anime, given that Brotherhood is a no-frills adaptation of the manga, there is almost no filler and therefore it lacks some of the more memorable creative decisions of the 2003 series. The exception to this filler is the very first episode of Fullmetal Alchemist Brotherhood, which feels like a pilot for the show instead of a meaningful episode. Aside from some good action it also completely undercuts several important and weighty reveals in the series, including immediately waving a very large, very red flag in regards to the state military and the big bads of the show. I was unimpressed with this choice, but it’s relatively harmless in the long run. One of the other slightly confusing decisions is the choice to completely omit the story of the Elric brothers in the Mining Town, a story included in the manga and 2003 series, but warrants nothing more than a passing mention in Fullmetal Alchemist Brotherhood. The main issue with this is that the show discusses how state alchemists are ‘the dogs of the military’ but never really shows how that affects characters, especially Edward. 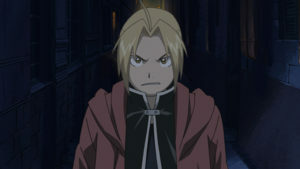 Basically, there is plenty of talk about how state alchemists are reviled by the populace, but Edward is basically never treated poorly by the citizens of Amestris for being a state alchemist. This is the entire point of the section in the Mining Town, as the people who live there distrust Edward BECAUSE he is a state alchemist and they view those kinds of people as soldiers who have sold their souls. 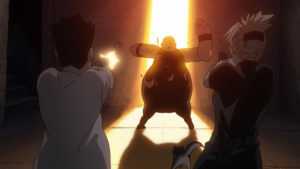 There are extremely valid reasons for the citizens to hate state alchemists, and this distrust (including their part in the Ishvalan conflict) is explored further in the series through other characters, but an earlier episode exploring Edward’s experience exists in the manga and it is odd that this was the episode from the 2003 series and manga that they chose to not recreate in Fullmetal Alchemist Brotherhood. That being said, like the manga the rest of the narrative is expertly crafted and well balanced. As the episodes progress, multiple mysteries and stories take shape, as the goals and ambitions of the Elrics, Colonel Mustang and crew, childhood friend and automail mechanic Winry, state alchemist killer Scar, and the menacing Homonculi begin to intermingle and take shape. 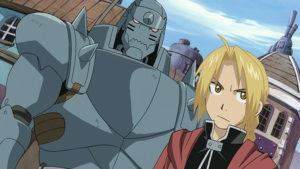 Fans of the 2003 show that have never read the manga or seen Fullmetal Alchemist Brotherhood also have a whole lot of new characters and situations to look forward to, including the people from Xing who crossed the desert to reach Amestris in search of the Stone, and the segment at the northern border with Major General Armstrong and her soldiers, operating on a completely different level to the military posted in Central. Fullmetal Alchemist Brotherhood (and the series in general) is honestly one of the best anime at creating a world that functions and grows and feels tangible and believable, with characters and their stories intersecting naturally in every possible meaningful way. Fullmetal Alchemist is one of the only anime I know of that has a beloved English voice cast, and for good reason. As a long believer in watching content in the language it was fist created in, Fullmetal Alchemist is the one series I break that rule for every time. 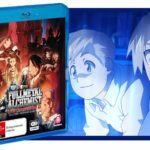 Speaking of the voice cast, the special features contains episode commentaries on different discs where the English cast discusses the differences between recording for Fullmetal Alchemist Brotherhood and the 2003 version. They aren’t bad discussions, and there are some interesting insights to be had. Special features also include the usual textless opening and closing songs, and I have to say, each opening and closing from Fullmetal Alchemist Brotherhood is fantastic, both songs and visuals. Special shout out to Tsunaida Te by Lil’B which I have been listening to on loop while writing parts of this review. This series is essential viewing for anime lovers and fans of tight, expansive narratives with a truckload of unforgettable characters. 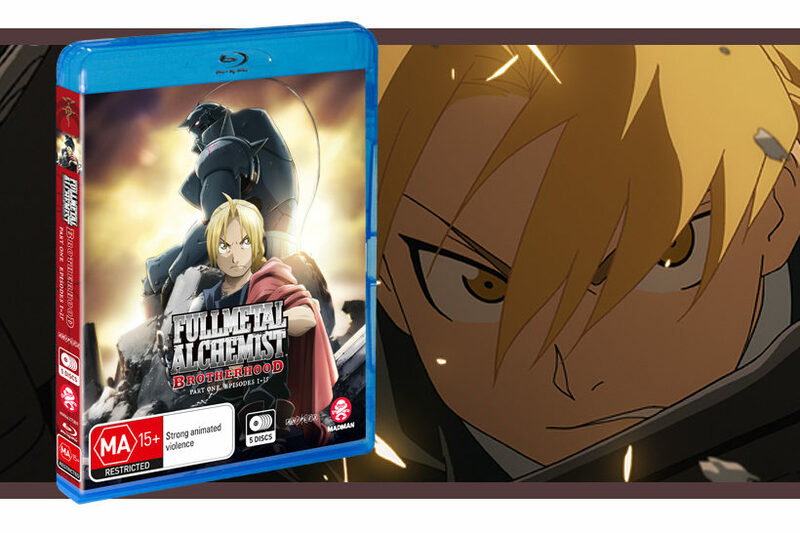 In writing this review I have had to come to terms with my inability to completely express how wonderful Fullmetal Alchemist is, it’s a series that is just so much and I am but a mere mortal writing a review that is under 1,500 words. Oh well, maybe I can get it right for part two.